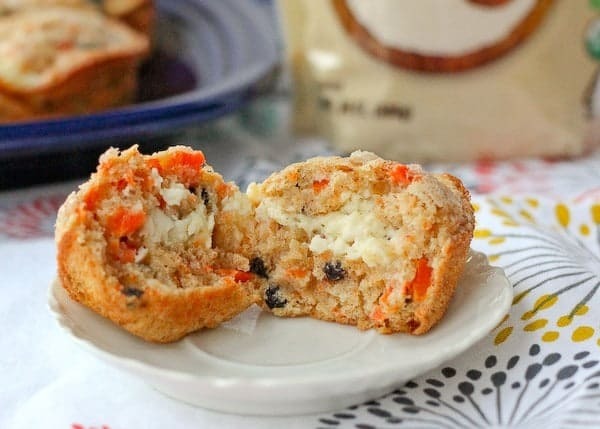 You won’t be able to stop eating these amazing carrot cake muffins with cream cheese filling – and the crispy sugar on top is an absolute must! 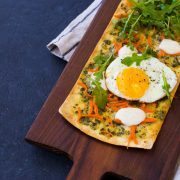 In The Raw® sweeteners asked me to come up with an Easter-inspired recipe using their new Sugar In The Raw Organic White® and my mind almost immediately went to carrot cake. My mom and I brainstormed recipes for awhile. I mean, we brainstormed a lot of recipes. Some of hers I immediately shot down, and some of mine she immediately dismissed. We had a few ideas that were almost perfect, but not quite right. Finally we settled on these carrot cake muffins with cream cheese filling. Something about carrot cake just screams Easter — maybe it’s because that Easter bunny just loves those carrots! These muffins would be a perfect breakfast before you head off to church, or they’d be great on the lunch table. Or with your afternoon cup of coffee. And of course, the best thing about carrot cake is the cream cheese FROSTING! We put “frosting” in the middle of the muffin instead of on top. It turns into a creamy, rich center that is just perfect. Instead of grating raw carrots which can sometimes lead to a stringy, half cooked carrot, I cooked the carrots and smashed them. 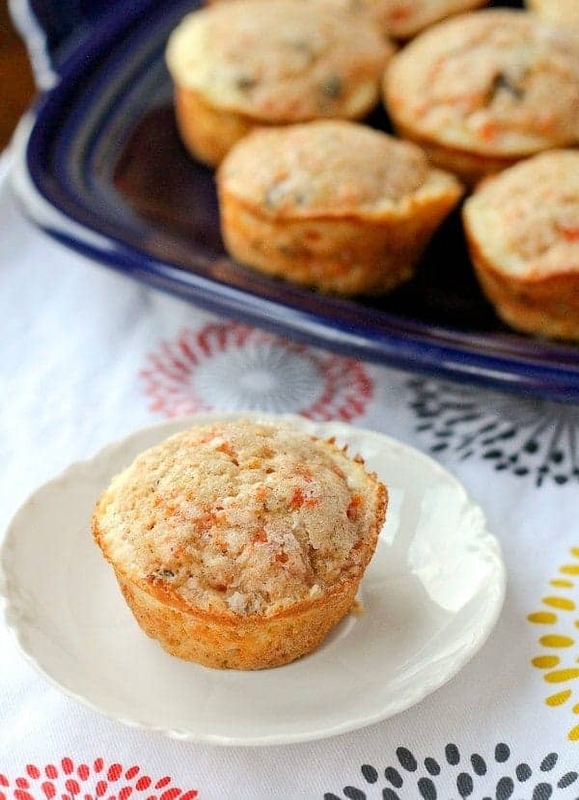 If you have leftover carrots from a dinner, these muffins would be a great use for those carrots. Smash them up so you still get small pieces of carrots throughout the muffins but you’re not left with huge chunks or icky strings. Also starring in these muffins are currants instead of raisins. Smaller in size than raisins, they give a perfect bite of sweetness without overwhelming everything with their flavor. 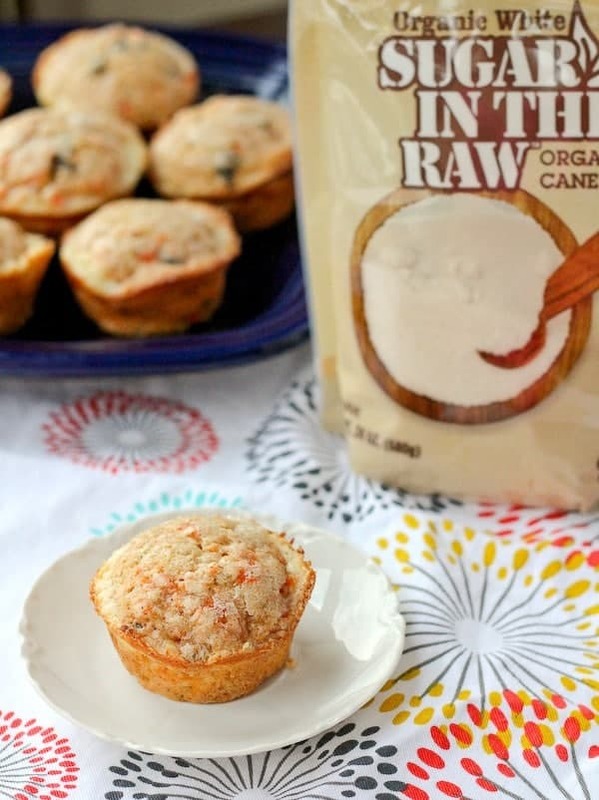 The great thing about Sugar In The Raw Organic White is that it is perfect for baking. 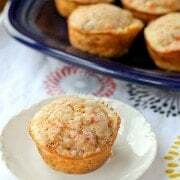 So perfect and versatile that I was able to use it in the muffin batter, the cream cheese filling AND the irresistible crunchy sugar topping. Seriously, I want to make these muffins on a weekly basis. Make them for Easter — pretty please? 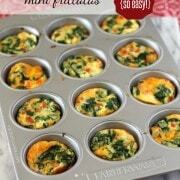 Spray muffin tins well with nonstick cooking spray. In a medium bowl, mix together flour, 3/4 cup Sugar In The Raw Organic White® organic cane sugar, baking powder, cinnamon, nutmeg, cardamom, salt and currants. 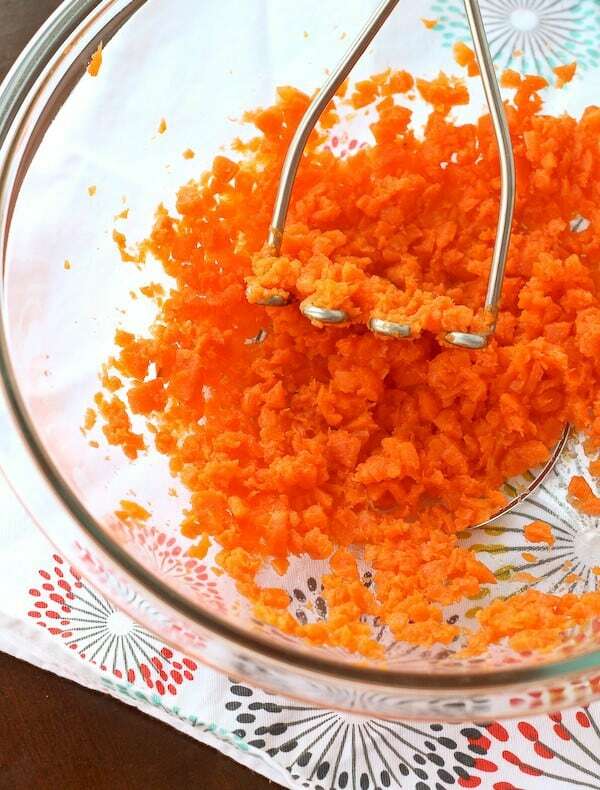 In a large bowl, mash carrots using a potato masher or fork – mash until no large chunks remain. Add applesauce, canola oil, eggs, egg whites, and vanilla extract. Stir until combined. Add dry ingredients and stir until just combined. Fill muffin tins 1/3 of the way full with muffin mixture. 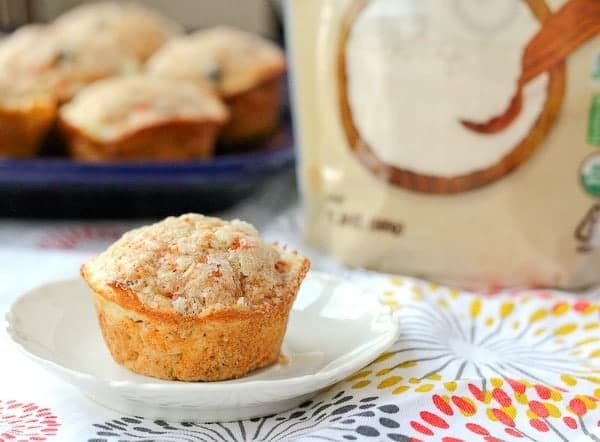 Drop cream cheese mixture into middle of each muffin (about 1 tablespoon into each). Top with remaining muffin batter. Bake for 350 degrees for 25 minutes or until golden brown. Let cool for 3-4 minutes in muffin tin before removing to a rack to cool completely. Serve warm or store in fridge in a covered container. Note: Great for leftover carrots! Husband’s take: Ben loved these. E & N LOVED these. My parents loved these. They got 5 stars allllll around. Changes I would make: None! Sugar In The Raw Organic White® is from the maker of Sugar In The Raw® and is part of the In The Raw® family of sweeteners, which also includes zero-calorie Stevia In The Raw® and Monk Fruit In The Raw®, and Agave In The Raw®. You can find out more about In The Raw on Facebook, Twitter, Pinterest, YouTube, and on their website. Find out where to buy Sugar In The Raw Organic White® using their store locator. This is a sponsored conversation written by me on behalf of In The Raw via Burst Media. The opinions and text are all mine. So glad to hear it worked out with buttermilk! Smart substitution. Thanks for taking the time to come back and leave a comment! Sorry that was unclear! You add them in with the whole eggs. 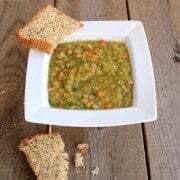 I clarified the recipe a bit to help. Thanks for the feedback!